Camping Villaggio Rosapineta is a leading luxury camping site that can be found on the northeastern coast of Italy, less than a mile from Rosolina Mare. While the park stretches down to the ocean on one side, it is fringed on the other by a pretty pine forest and this is the perfect place for families to get back to nature while also enjoying the camping holiday of a lifetime. Contact our Lux-Camp representatives to learn more. Why Should I Camp at Camping Villaggio Rosapineta? 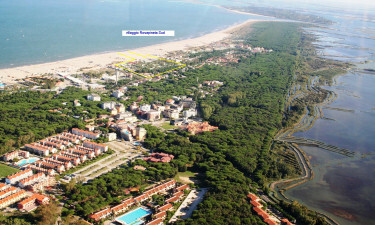 We know Camping Villaggio Rosapineta! There are several different types of accommodation for families to choose from, each of which boasts modern conveniences and plenty of space. In addition to the stunning natural setting, the city of Venice is just a short drive away and this makes the perfect destination for lovers of luxury camping who want to take a day trip. 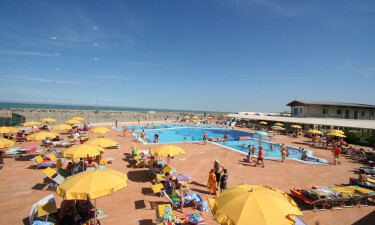 The close proximity to a gorgeous sandy beach is one of the main highlights of this impressive Lux-Camp, while 2 large swimming pools and a water slide can also be found on the site itself. There are also modern laundry and shower facilities for guests to make use of. Holiday makers will find an excellent range of facilities just a short stroll from their mobile home. There are 2 large restaurants on the site, which serve freshly prepared Italian meals and treats from around the world, while the onsite supermarket also offers fresh local produce, such as bread, cheese and Italian sausage for guests to choose from.